As a personal chef I created a cookie that people with restricted diets could enjoy. Little did I know my creation would exceed my flavor and nutrition expectations. My cookies are protein packed (6 grams per cookie), with a low glycemic load offering you even, clean energy. Welcome to a paradigm shift in snacking. Celiacs, vegans, athletes, kids, diabetics, anyone craving a good old fashioned cookie without the guilt has found their answer. 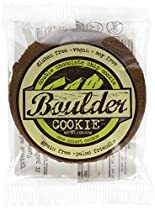 Small batch baked in the natural foods hub of America…Boulder Cookie, let us nourish your craving!